Home / autographing • Conventions • Fanboying! • Outlander • Signings and Cons • The Lovely Erica • TV Heartbeat / Journey to Fraser’s Ridge at NYCC 2018 for Outlander season 4! 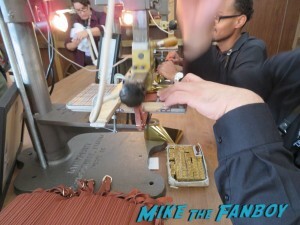 Prop replicas and cast signing! 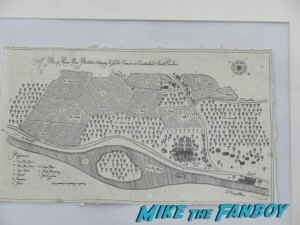 Fans at New York Comic Con could take a trip back in time to visit Fraser’s Ridge from the upcoming season of Outlander! 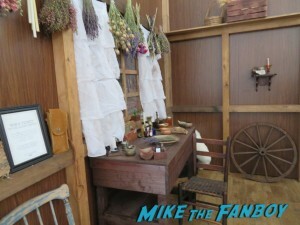 The Ridge included set recreations, prop replicas, generous swag and, oh, a little visit from the cast! 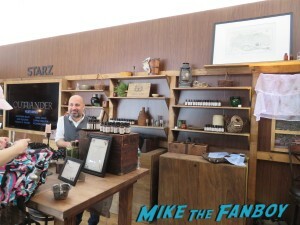 Starz always knows how to put together a booth for Outlander! 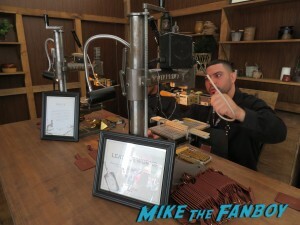 This year, the booth was filled with tons of details to get fans read for the season 4 premiere on November 4th! When season 3 ended, Claire and Jamie washed up on the shores of the new world. 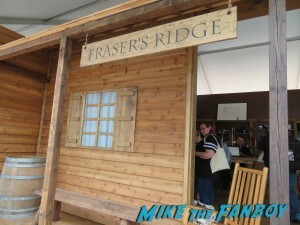 Fraser’s Ridge is going to be a verra important place for seasons to come. 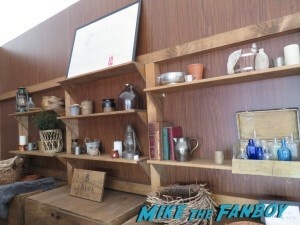 …and had the show’s art department recreate a couple of the key Fraser’s Ridge props: the deed and map. 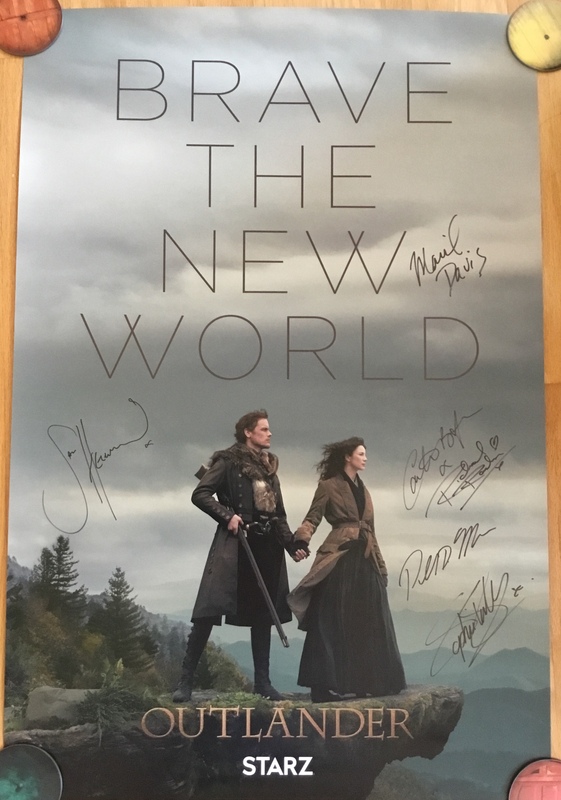 People who had the Starz app also walked away with some generous swag! 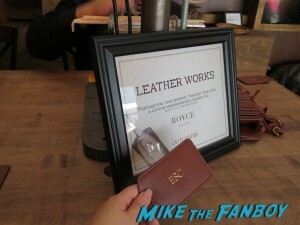 How about a gold-embossed leather luggage tag for all your (time) traveling needs? 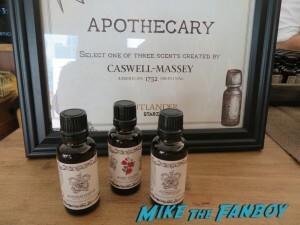 And to represent Claire, how about some essential oils with vintage labels from that era? The cast was 50 minutes late (!!!) but their schedule had a generous cushion so fortunately everyone got through the line. 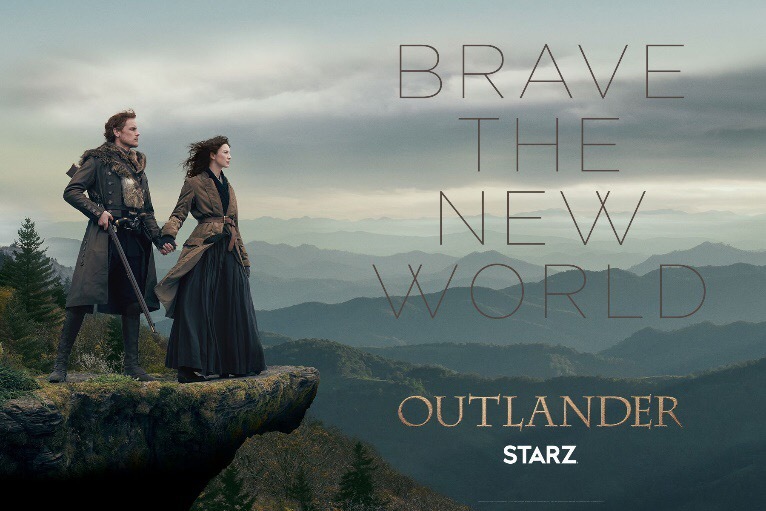 The signers included: executive producers Ronald D. Moore & Maril Davis, Caitriona Balfe, Sam Heughan, Sophie Skelton and Richard Rankin. The cast and creators are all lively and engaged well with the fans. I did mention to Sam how we missed him at Wizard World Chicago this year. 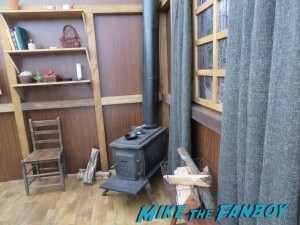 (If you haven’t heard about the mess, check out my re-cap of his “virtual appearance.”) He sighed, ducked his head a little and said he’ll try to make it next year to make up for things. They signed a lovely, but very large poster. It’s very nice, but hard to transport, especially on a rainy day at an outdoor booth. At least security was nice enough to let fans have a moment to try to bundle the posters away before they shoo’d us out. 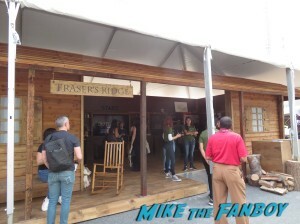 And that’s what went down at the Outlander booth! I’ll be posting a photo gallery from the panel so stay tuned for more Outlander at NYCC! 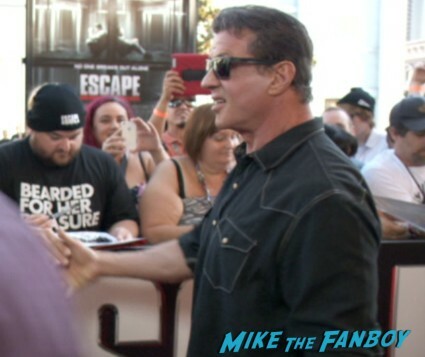 Escape Plan Movie Premiere! Direct From Comic Con! Sylvester Stallone! Arnold Schwarzenegger! Autographs! Photos! Action Adventure Coolness! 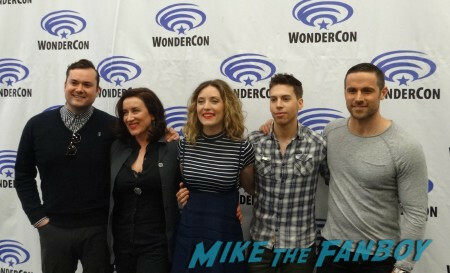 Orphan Black takes over Wondercon 2015!! 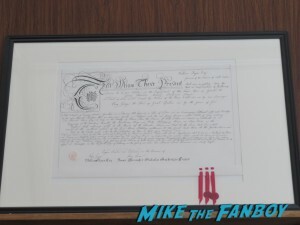 Signings and Photo Gallery! Jordan Gavaris! Maria Doyle Kennedy! Dylan Bruce! Spending An Afternoon Getting To Meet Comedy Legend Ms. Lily Tomlin and Waiting For Clue: The Movie Star Ms. Eileen Brennan! Thanks, Erica!!! 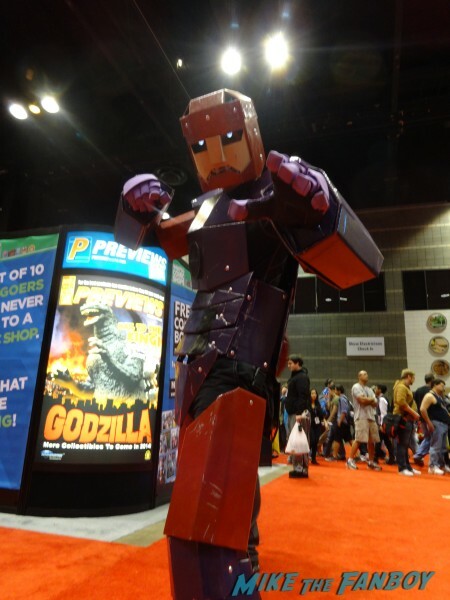 Sam in Chicago next year….. not holding my breath, but that could be fun!!! I am sorry that the schedule got changed with Sam and Cait. But I had a great time at WWCC and now am the wiser about last minute changes. Probably won’t go to another unless it is closer to home. We had nonrefundable plane tickets so we would have been out $300 each just on airfare. Thanks for the feedback, Francine! 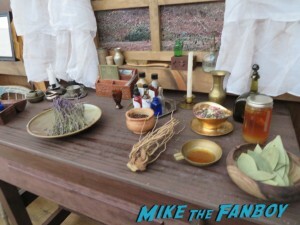 The Outlander community is so much fun!